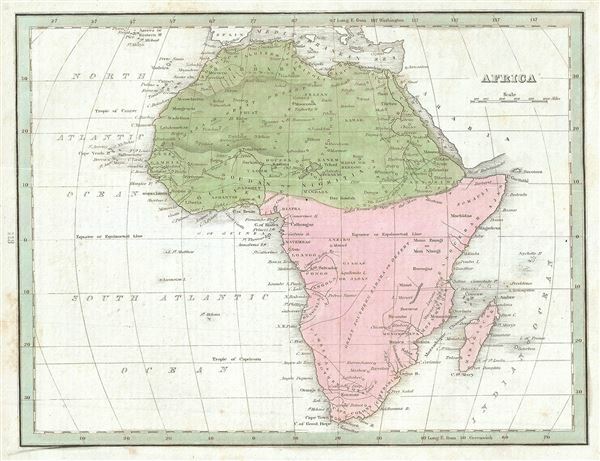 An interesting example of the 1835 map of Africa by the important American mapmaker T. G. Bradford. This is an early 19th century and historically important representation of the continent of Africa. Nineteenth century mapmakers were particularly challenged by the difficult task of deciphering Africa. Despite a fairly constant flow of information about the continent dating to the middle ages, much of the interior remained speculative at best. Bradford chooses to leave most of the interior blank and instead focuses known areas, or more precisely, areas perceived to be known. These include Mediterranean North Africa, Egypt, Abyssinia, the western Niger valley, the Congo, South Africa, and the lands of Mozambique and Monomotapa (Zimbabwe). Each of these regions have their own unique history of European contact. Egypt, along the Nile, had been well mapped even in antiquity. The same is true of Christian Abyssinia which, through regular contact with the Coptic mother church in Egypt and Portuguese missionaries, was well known, if mostly unexplored by Europeans. The tale of European incursion and occupation of South Africa could easily encompass volumes and explains Bradford's sophisticated mapping of this region. The Niger Valley and the Congo had been simultaneously exploited and explored by Portugal and later Belgium since the 1300s. Monomotapa, opposite the island of Madagascar, was a major stopping point on the Portuguese trade routes to India. Curiously this region has also been associated with King Solomon's Mines and Biblical legends of the Land of Ophir. Bradford identifies Monomotapa, which by this time had long fallen into decline. He also identifies several of its constituent states including Manica, Sabia, and Sofala. The remaining parts of the map are frequently quite vague. Bradford does note several important and recognizable African tribal groups including the Hottentots, the Tibboos, the Tuaricks, and others. North of the Monomotapa region we can find Lake Maravi, a long narrow lake oriented on a north-south axis. This lake most likely represents Lake Malawi or Lake Tanganyika, or both. The Ptolemaic Mountains of the Moon are drawn stretching across the central part of the continent with the suggestions that they are the source of several branches of the Nile. The map was published as plate no. 113 in Thomas G. Bradford's 1835 Comprehensive Atlas Geographical, Historical and Commercial. Bradford's atlas, published in 1835 was an important work on many levels. First, it was one of the first American atlases to follow an encyclopedic format, offering readers extensive geographical and statistical tables to supplement the maps themselves. Second, it was published in Boston and influenced the city's rise as a publishing center later in the 19th century (at the time most publishing in the United States was restricted to New York and Philadelphia). Third, this atlas was the first to contain a separate and specific map showing the Republic of Texas. Fourth and finally, Bradford's atlas in some instances broke the Euro-centric mold regarding atlas production. Among other things, Bradford focused his atlas on the Americas and abandoned the classical decoration common in European atlases in favor of a more informational and inherently American approach.